Commodity bulls are pinning hopes on more aggressive Chinese stimulus. There’s good reason to expect it. But Beijing may struggle to revive the building boom that has fed the super-cycle. If so, it’s hard to see a reversal of the mining sector’s recent underperformance. 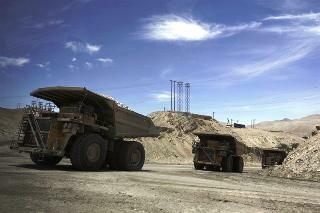 Mining trucks travel along a road inside Chuquicamata copper mine owned by Chile's Codelco, the world's No. 1 copper producer. Codelco last Thursday locked in a razor-thin 3.75% coupon on a new 2020. China’s imports of major commodities fell in June from month-ago levels, according to trade data released on July 10. Annual net imports in the world’s second-biggest economy grew 6.3 percent last month, about half the rate economists had expected. The latest Chinese data also showed consumer and producer prices easing more than expected in June - a sign of falling demand. Some analysts expect Beijing to respond to the softening economic picture with more aggressive policy stimulus. China has already taken some steps to spur growth. Last week the central bank unexpectedly cut rates. It has also moved to reduce bank’ reserve rate ratio in attempt to spur more credit creation. Faltering demand in China has contributed to recent price declines for key commodities such as crude oil, copper and iron ore, pressuring shares in the world’s biggest mining and energy companies.